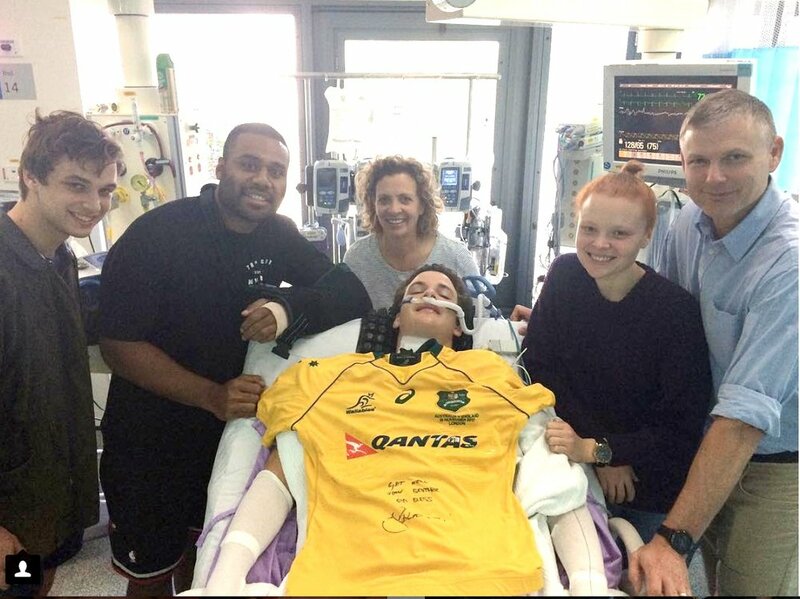 WHEELCHAIR-bound Conor Tweedy celebrated his 17th birthday in hospital today, with the fighter sporting the broad smile that he has worn almost since the day of his traumatic neck injury in a scrum collapse three months ago. 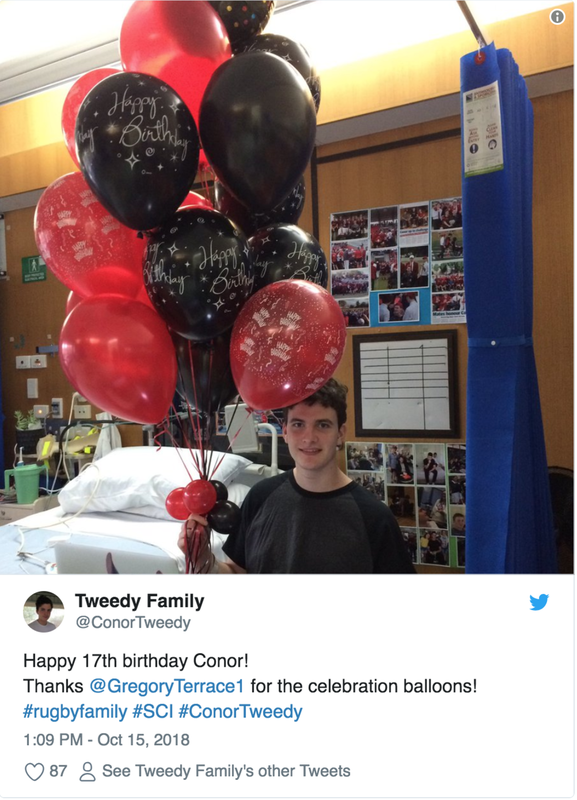 The Tweedy family posted a photo to Twitter from his room at the Princess Alexandra Hospital, with Conor holding a fistful of red-and-black balloons in the colours of his school Gregory Terrace. “Happy 17th birthday Conor. Thanks @GregoryTerrace1 for the celebration balloons #rugbyfamily,” read the tweet. Clutching the balloons in his right hand is an achievement in itself. The Year 11 student can now offer a handshake, if not for 100 well-wishers then certainly for those few at the front of the queue. “The fact Conor can push his wheelchair independently is a really big thing and the first two or three people he meets can now get a firm handshake,” father Sean said. Getting more finger function is one of Conor’s ambitions although he can now do some single finger typing on a keyboard. 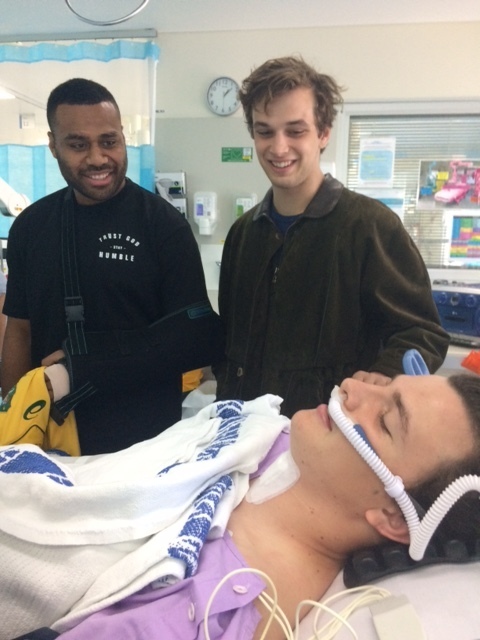 Conor has been in hospital since his neck injury on July 21 when he was caught awkwardly in a scrum collapse in a Second XV GPS schools rugby union match against Brisbane Boys’ College. He has diligently ticked off little gains with daily exercise therapy in hospital and visiting the YMCA at Bowen Hills last month, to watch wheelchair rugby, was his first leave pass from hospital. 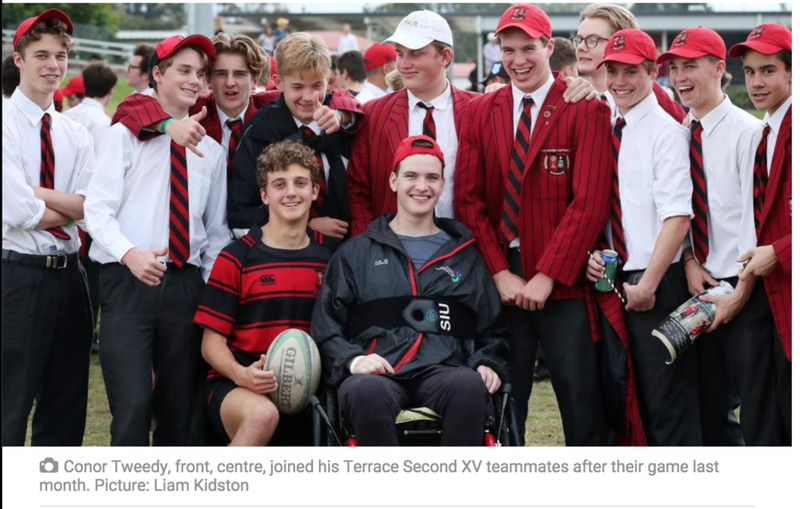 He followed up with a visit to Tennyson to watch his schoolmates playtheir final home game of the GPS rugby season. Tickets went on sale today for Conor’s Long Lunch, a major fundraiser for the Tweedy family and spinal injury awareness. The open-air event will be held at the school’s Tennyson playing fields on Saturday, November 24 with live music, bands, DJs and food trucks bringing the event to life. 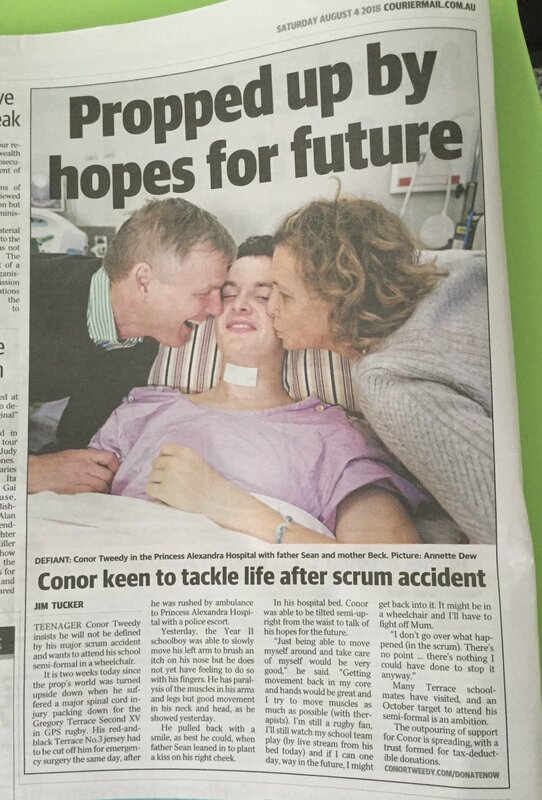 One month on from the accident Bec and Sean speak to ABC radio about the day of Conor's accident and how proud they have been of him in the days since. U17 South’s Rugby Team (including boys from Lauries, Villanova, Ipswich Grammar, Terrace and State High) showing their support for Conor. All grades at UWA v Perth in Green armbands to support our rugby brother Conor.